We are constantly finishing projects and taking on new ones. Take a look at the current construction and restoration projects or come by and see for yourself! Freda is sailing the bay, serving students in our educational programs, racing in classic yacht regattas, doing the occasional charter, and playing her role as “the matriarch of San Francisco Bay.” Friends of Freda is a community program where a dedicated group of volunteers maintains and sails her. If you are interested in sailing with us or joining our crew or helping us maintain this historic vessel email Info@spauldingcenter.org. Designed and built by Myron Spaulding, Arete is a Greek word that means best. Commissioned by Bob Crowley, Myron Spaulding's lifelong friend, Arete's keel was laid in 1958, with a myriad of circumstances delaying her launching until 2005. Arete was designed as a bay and coastal racer/cruiser of her era. She is constructed of mahogany with white oak frames, and full length carvel fir planking. Her fastenings are silicon bronze and her ballast keel is lead. Arete is 28' overall. Shown in the photo with her construction molds above, she has been launched, lives at our dock, and now sails the Bay. The SV14 is a unique design, created by Alex Simonis and Maarten Voogd, to enable people with disabilities to enjoy sailing. Boats for disabled sailors are often prohibitively expensive, but the SV14 is built from CNC-cut marine plywood, and designed for amateur builders. Master boat builder and volunteer Peter Saggers built this SV14 here at Spaulding Marine Center, as one of five prototypes being built around the world. International collaboration continues to make a high performance sailboat for disabled sailors a reality. We completed our SV14 and donated her to our friends at BAADS (Bay Area Association of Disabled Sailors), but we continue to support and consult on the development of the SV14 around the world. Iqyax are the traditional craft of the Aleutian Islands of Alaska. The technology of building iqyax was built over 10,000 years, then nearly lost in the last 150 years. A few dedicated craftsmen and historians have re-created iqyax from the few remaining examples found in the islands and museums, and started a thriving resurgence. 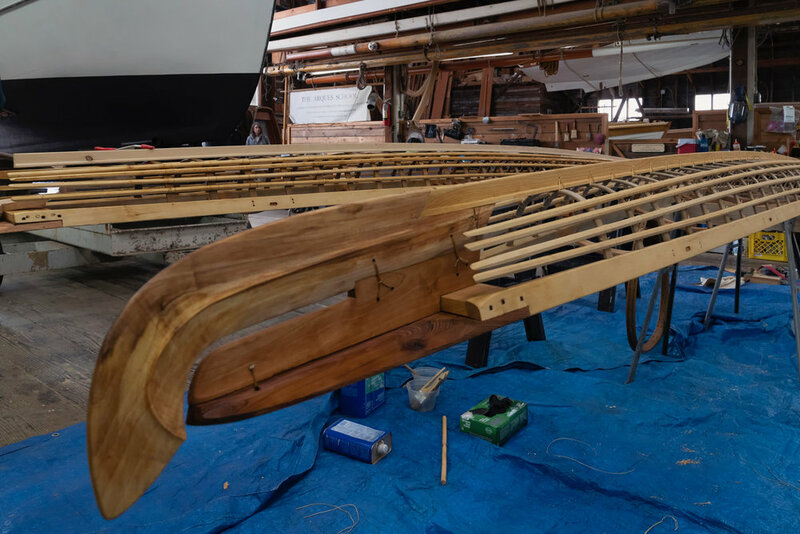 In November 2018 Spaulding hosted a 9-day intensive workshop, during which three new iqyax were built, two of which will be raced in the Aleut cultural festival on Unalaska Island in 2020.